I have mixed feelings about the change of seasons. I’m a spring/summer kind of guy, and I always suffer a little melancholy as September rolls around. Summer vacations are over, and Atlanta traffic indicates kids are back in school. I can’t describe it, but there’s something in the air that changes this time of year. We’re still warm in Atlanta, but maybe it’s the angle of the sun and the clearer air. Things just look different. All signs point to the arrival of fall. Once I’m over my feelings about the end of summer, I go with the flow and enjoy those cool, crisp, sunny days; jackets; apples; and fall comfort food. Speaking of comfort food, I must say that my tastebuds start craving soups, stews, chili, and stick-to-your-ribs dishes. Maybe I’m a little fickle with my love of summer, because I’m so ready to drag out my 9-quart Le Creuset and make a big pot of something warm and delicious. Before those more substantial foods start packing on the calories, I’m going to balance what’s on our table with some lighter fare. For today’s post, I’ve created a Thai-flavored salmon with ginger and shitake mushrooms. My Thai friend, Su, taught me years ago that Thai dishes contain sweet, sour, salty, umami, and spicy flavors. The glaze for this dish contains honey for sweet flavor, lime juice and rice vinegar for sour flavor, fish and soy sauces for salty and umami flavor, and sriracha sauce for spicy flavor. Adding ginger and garlic rounds out this glaze and creates a super delicious topping for the broiled salmon. 1. In a small bowl, whisk together lime juice, fish sauce, soy sauce, rice vinegar, honey, Sriracha, and 2 tablespoons sesame oil. 2. Preheat oven on broiler setting. Cover a baking sheet with parchment paper. 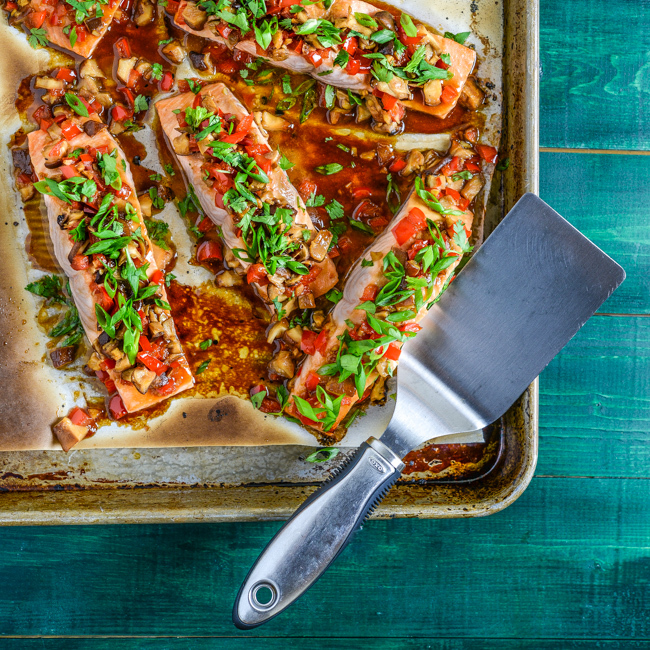 Place salmon filets on a baking sheet and brush with lime and soy mixture. Place under broiler for 3 to 4 minutes. 3. While salmon is cooking, heat 1 tablespoon sesame oil in a large skillet over high heat. Add garlic and ginger and saute for 30 seconds, stirring frequently. Add red pepper, sauteing from 1 to 2 minutes. Add mushrooms and continue cooking for 1 to 2 minutes until mushrooms are almost done. Whisk cornstarch into remaining soy mixture and pour into skillet. Continue cooking for 1 minute until glaze is thickening. Remove from heat. 4. Remove salmon from oven and spoon mushroom and ginger glaze over filets. Return to oven and continue broiling for 4 to 5 minutes or until salmon flakes when pressed. Cooking time will depend on the thickness of filets. 5. Remove from oven, garnish with sliced scallions and cilantro, and serve immediately. Thanks for stopping by SBD, Trina! So glad you enjoyed the recipe! I was in NW Arkansas and was able to catch a glimpse of fall, which I miss living here in SoCal. Love the flavors and confetti of color in your salmon dish. Sadly, I can’t use either soy sauce or fish sauce because of its sodium content. But I have discovered some substitutes for bringing umami to Asian dishes. Oh, but Bart is going to flip for this! I am always on the lookout for new ways to prepare his beloved salmon, and this looks like something he’ll enjoy. Thanks a million, and I hope you are enjoying the slide into fall. PS I keep forgetting to tell you that my neighbor is Bill Harris “At The Movies” (an 80’s icon). Two of my favorite things: salmon and Thai flavors. You got the holy trinity just right. Gorgeous! Salmon is a weeknight staple in my household, so this recipe is perfect for me. Definitely going to be recreating it.. looks delicious and full of flavour!